After yesterday's attempt by a Weibo account owner to fake a live photo of the Sony Xperia XZ4, we have to be a little cautious about renders that have surfaced on WinFuture (via Android Police) for the budget priced Xperia L3. The image does somewhat resemble an earlier render that leaked way back in October. However, the new render shows a front-facing camera on the phone's rather large chin. As a result, the Xperia L3 is expected to carry a notchless 5.7-inch display carrying a 720 x 1440 (HD+) resolution. This works out to an aspect ratio of 18:9. Thus, the Xperia L3 won't be as tall and thin as the flagship Xperia XZ4, which will reportedly have a 21:9 aspect ratio. The Xperia L3 should be equipped with a side-mounted fingerprint scanner and at least 32GB of internal storage (with a microSD slot for those seeking additional storage space). The dual camera setup on back is said to include a 13MP (or higher) sensor, and a depth sensor, and we could see a 3300mAh battery power up the phone. This phone is made of plastic, and is expected to be available in silver, gray, and gold. Pricing is expected to be in the neighborhood of 199 Euros ($225 USD at current exchange rates). Besides the flagship Xperia XZ4 and the low-end Xperia L3, Sony also has a pair of phones to replace its XA line of mid-range handsets. 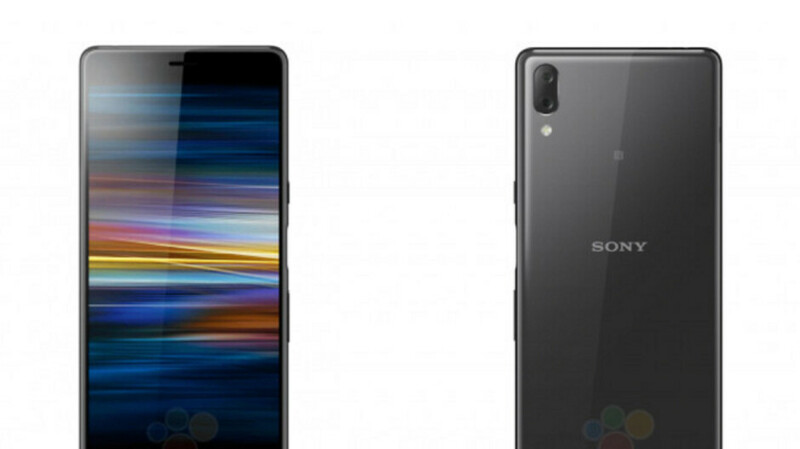 These two models could be named the Sony Xperia 10 and Xperia 10 Plus. Both will apparently feature the tall and thin 21:9 aspect ratio that is expected to be found on the Xperia XZ4. The pair will both sport a glass back and a dual camera setup. Renders for both models leaked earlier this week. The Xperia XZ4, Xperia 10, Xperia 10 Plus and Xperia L3 should be unveiled on February 25th in Barcelona during MWC. Will the 2019 Xperia lineup kick off a turnaround for Sony? From time to time, there have been rumors that Sony was hanging up the Xperia name and giving up the smartphone business. In January 2018, Sony CEO Kaz Hirai said that the company would continue to manufacture smartphones, but would no longer compete with Apple or Samsung. Then in April came word that the Xperia business unit would be downsized with a new focus on profitable devices. During the third quarter of 2018, Sony sold only 1.6 million handsets compared to the 3.4 million it sold during Q3 2017. That was a massive year-over-year decline of 53%. Sequentially, Sony sold 600,000 fewer handsets in Q3 than it had sold in Q2 for a 27% decline. For the fiscal year that ends next month, Sony expects to sell ship only 7 million handsets; originally, the company expected to deliver 9-10 million units during that time period. Sony expects its smartphone division to post losses through next year, and is working to reduce the operating costs of the division by 50%. Those of you who go back a few years might recall that Sony originally partnered with Ericsson to produce cell phones. The company's first smartphone was the Sony Ericsson Xperia X1, powered by Windows Mobile. That phone was released in September 2008. Their first Android phone was the Xperia X10, launched in March 2010. A year later, the Sony Ericsson PLAY was born, featuring a slide-out game pad. The first Android gaming phone was not a huge hit. Interestingly, it was seven years ago tomorrow when Sony bought out Ericsson's stake in the joint venture. While Sony doesn't expect the smartphone division to produce black ink until 2021, that doesn't mean that it is throwing in the towel for this year. Still, we won't know whether the 2019 Xperia lineup is strong enough to show some improvement for Sony's smartphone unit later this year. They should call it the Rihanna of smartphones, if you know what I mean. Damn. That's harsh. She's still fine though. She's super fine, but with a gigantic forehead that shines bright like a diamond. Haha. I can dig it. This is garbage, they just flipped display upside down to get rid of the chin. lol. SONY is out of ideas. Then can a fanboy like yourseld explain why even Sony is trying to follow this bezel-less trend? And you are super delusional if you think the top flagships of the past year best feature is a bezel-less design. I highly doubt barely selling in Canada has much to do with Sony's sluggish sales. Canada wouldn't even rank in the top 20 as far as biggest markets go. the location of the fingerprint sensor on the Sony XZ2 & 3 shows Sony doesn't know how to design a mobile phone.